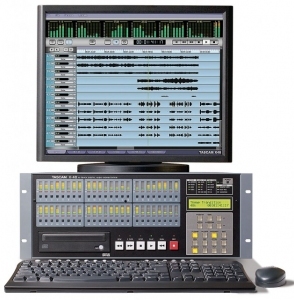 TASCAM's new X-48 is the world's first standalone 48-track Hybrid Hard Disk Workstation. 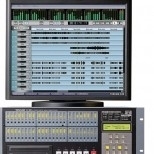 Co-Developed with SaneWave, it integrates the best of both worlds: the stability and ease-of-use of a purpose-built hard disk recorder, with the GUI, editing and mixing features of a computer-based digital audio workstation. It boasts up to 96kHz/24-bit Recording across all 48 tracks. 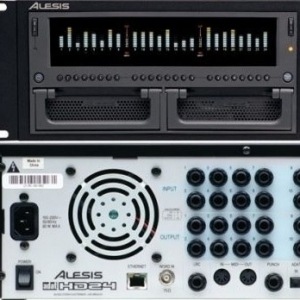 Its file compatibility and synchronization surpass even the TEC Award-winning MX-2424, with native Broadcast WAVE audio file support and AAF export for compatibility with workstations like Pro Tools, Nuendo and Logic. Support for FireWire hard drives and Gigabit Ethernet allows simple transfer between systems, making it the ultimate multitrack solution for high-quality music, post and live Recording applications. 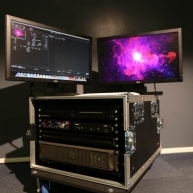 Yet the X-48 goes beyond mere standalone recorders -- its built-in, automated 48-channel digital mixer, VGA display output, powerful editing functions and DVD+RW backup drive transform it into a complete integrated workstation. TASCAM, the company that invented the home studio revolution, is one of four divisions of TEAC Corporation, a $1.2 billion manufacturing company headquartered in Japan. While the other divisions of TEAC have grown into a multitude of high tech industries including data storage devices, consumer electronics tools and industrial products, TASCAM has remained dedicated to making innovative products for capturing creativity in the field of music and audio. The beginning of TASCAM starts with the founding of TEAC nearly fifty years ago. In 1953, a pair of engineers in Japan - the Tani brothers - created the first TEAC product line, which was comprised of open-reel audio tape recorders. In the late 1960's, the Tani brothers and Dr. Abe, a senior engineer at TEAC, formed a special R&D group named TASC (TEAC Audio Systems Corp.) for the purpose of researching ways to apply TEAC's recording technology for musicians and recording studios. TASCAM (TASC AMerica Corp.) was established in 1971 for the purpose of distributing TASC products in the U.S. and conducting additional market research. The company's first home was at 5440 McConnell Avenue, on the west side of Los Angeles near Marina del Rey. During the formative years in the early '70s, the music scene was flourishing. Musicians who wanted to showcase their talents and abilities to the recording industry needed a cost effective means to record their music. However, most musicians could afford neither the expense of recording in a professional recording studio nor the asking price of professional recording equipment. Realizing the dilemma facing these musicians, TASC adopted a philosophy of manufacturing recording equipment that offered the uncompromising quality and durability of professional studio equipment while remaining affordable to the masses. Sound recording is a form of recording or reproduction using electrical and mechanical translation of the sound waves. The sounds recorded are usually spoken voice, instrumental music, singing and sound effects. Audio recording can either be analog or digital. Analog recording uses a transducer such as a microphone to record sounds analogous to the air pressure surrounding the sound being recorded. The analog recorder may use a microphone diaphragm for acoustic sound recording. This microphone is highly sensitive to changes in the pressure of the acoustic sound waves. It records these sounds in graphic representations such as the phonograph that records grooves with a stylus. Sound waves from electronics can be directly reproduced from the pickups of an electric guitar or synthesizer. These are commonly used by musicians to hear how well they are doing during a recording session. Digital recording is the direct recording of audio or video into a storage device that records it as binary numbers representing the modifications in atmospheric pressure of the sound. The record can be stored and read back to be reproduced. This type of recording is more accurate and is more resistant to errors compared to analog recording. Both however have their own limitations. The analog system is bound by the capabilities of the medium and circuits used to record. In the digital system, the ratio of signal to noise is bound by the bit depth of the modification from analog to digital. Natural noise is a common limitation of both recording systems.